Large numbers of people will gather at Seaclose Park in Newport this week to enjoy the popular Isle of Wight Festival, which runs from Thursday 21 June, until Sunday 24 June. 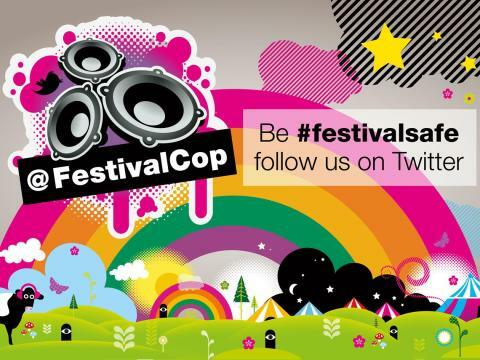 Hampshire Constabulary is maintaining its close co-operation with festival organisers, Solo, and our partner agencies to keep crime as low possible so that festival goers can enjoy a fun and safe event. Hampshire Constabulary’s Isle of Wight Festival police commander, Superintendent Simon Dodds, said: “The Isle of Wight Festival has maintained a reputation for having low levels of crime and a congenial atmosphere which continues to attract visitors every summer. “Last year, we saw an overall reduction in crime from previous years, which is in-keeping with the festival’s reputation for being relaxed and family-friendly. “We want festival-goers to enjoy themselves safely, and we want any criminals to be warned off by our consistent rigorous approach to protecting the island. Hampshire Constabulary’s Crime Prevention Advisor said: “Rest assured that before the festival has even begun, work is well underway between Hampshire Constabulary and its partners to develop a plan to ensure the event runs smoothly. “Every year we advise festival-goers to take note of the crime prevention advice on our social media channels, and also the useful information on the festival page on our website, to help us maintain a low level of crime. “Upon arrival, festival-goers are invited to spend time at our festival police station in Seaclose Park, in the ‘Electric Ladyland’ area of the site, where we’ll be offering further interactive ways to stay safe throughout the festival. Last year's Isle of Wight festival saw a significant drop (72%) in the number of overall thefts reported, compared to 2016’s festival. While this is a positive, we advise members of the public not to be complacent and to remain vigilant to the risks of leaving valuables in tents. Although we strongly advise leaving valuables at home, we understand you may have to bring some with you. If you do, keep them safe at night by keeping them in your sleeping bag while you sleep. It is not just a phone you could be losing, but sentimental photographs and memories too. We would also advise festival-goers to make a list of all the serial and model numbers for electrical items and register their possessions with IMMOBILISE. This ensures they are properly marked, so police can identify the owners of recovered property with ease. Please visit www.immobilise.com for further details. Hampshire Constabulary’s Roads Policing Unit (RPU) Inspector Steve Wakeford said: “Teamwork involving all agencies is a crucial part of ensuring the safety of island residents and visitors on the roads during festival season, and we will be supporting our partners’ traffic management plan. “It is one of the busiest weeks of the year for the island so some delays will be inevitable, so I would remind all road users to allow more time for their journeys during the week of the festival. “Throughout the festival, roads policing officers will be carrying out anti- drink and drug driving operations as part of the summer impairment campaign. Hampshire Constabulary is supporting Isle of Wight Council, Island Roads, traffic management contractors CTM, and festival promoters, Solo, in communicating traffic information via local radio, news websites, and social media. Superintendent Simon Dodds said: “The Isle of Wight Festival organisers are retaining a clear and tough stance against illegal drugs. Their use and sale will not be condoned or tolerated at the festival, and people suspected of carrying and supplying illegal drugs will be searched. “This is part of the event security team’s drug disruption plans, including their use of passive drugs detection dogs and searches covering points of entry. “Amnesty bins will be provided by the event organisers in advance of entry points to give people the opportunity to surrender illegal substances. New psychoactive substances, previously known as ‘legal highs’, remain prohibited at the festival. They are now illegal to produce and supply. If reports of any sales arise, festival organisers will take action to stop them. Substances such as Nitrous Oxide - known more commonly as “Laughing Gas” or “NOS” fall into this category. These substances can be labelled as “air fresheners”, “herbal incense”, “research chemicals”, “plant food”, and “not for human consumption”. It is clear that some of these substances are far from harmless. They often contain a range of compounds which are rarely consistent, and are different to those advertised on the packet or at the point of sale. We have reviewed, and will continue to review, our security plans and capability around all pre-planned events taking place in Hampshire and the Isle of Wight, including this year’s Festival. It is normal procedure for us to work with event organisers in the run up to all large scale events to ensure they are run safely and securely. We urge the public to be alert but not alarmed - the police service and our partners are doing everything we can to help protect the security of our citizens, public institutions, critical national infrastructure, and businesses and places. In addition, we advise the public to remain vigilant and to report any suspicious behaviour or activity to police, in confidence on 0800 789 321, or online at www.gov.uk/ACT . In an emergency, members of the public should always call 999. Superintendent Simon Dodds said: “The safety and security of people elsewhere on the Isle of Wight remains an equally essential priority for local policing. “Our response to emergencies, crime and disorder across the rest of the island will be the same. Anyone should call 999 in an emergency as usual. “In Newport, extra high-visibility patrols will again be focused on the Fairlee Road area and surrounding side roads to provide reassurance and responses to any concerns raised by residents.